The holly sprig on this boy biking ornament is a festive seasonal touch that turns it into a fun Christmas gift for boys. 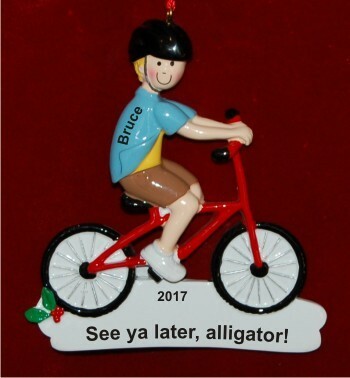 The bike fun boy blond personalized Christmas ornament features an authentically designed bike and boy and is customized with the information you provide. The lettering is painted by hand to create a unique personalized boys ornament that arrives with a display cord and our custom velvet gift bag. Put a smile on his face this year with the blond boy biking ornament, one of several boy on bike ornaments from Russell Rhodes. This one is available in brown hair and girl versions too.